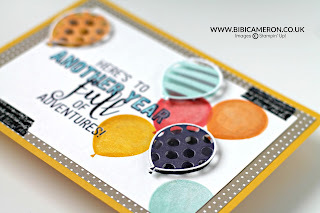 Balloon Pop Up Dies Stampin' Up! Introducing Ballon Adventures Stamp Set and Balloon Pop Up Thinlits dies from Stampin' Up! Available from January 4 in my Shop here! These products are incredible versatile. 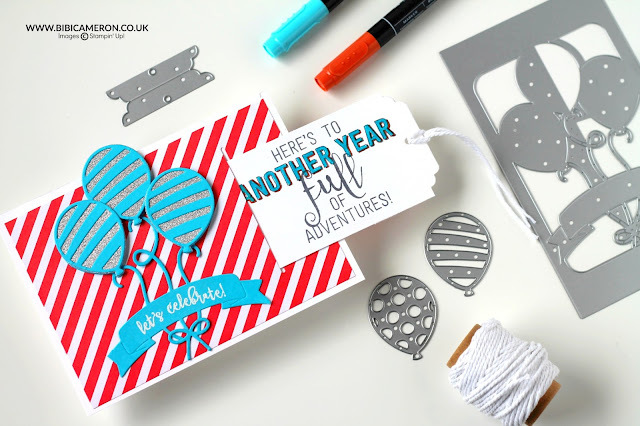 The multi step stamp set offer endless stamping possibilities as it contains 17 individual stamps and coordinates with Balloon Pop -Up Adventures dies ( 8 dies) and Balloon Bouquet Punch. It includes a solid balloon image and 2 textured balloon stamps, banners, accessories and strings and very important: it includes sentiments in different sizes! It is a birthday themed stamp set but you can play a bit with the words and make different occasion cards or mix and match with other stamp sets and dies. 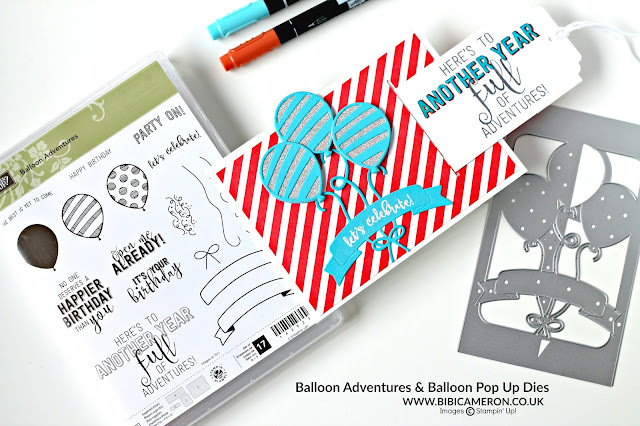 Balloon Pop -Up Adventures dies are just amazing to make easy and quick Pop Up cards but also to create intricate balloon shapes. You can also create ballon shaped windows or toppers for boxes and bags with not effort. oh! And there are also 2 dies to create pull up tags. The sky is the limit, and if you like balloons this is a have to have. This is a quick and easy card with a pull up tab. I simple used the pop up die to crated the card topper and with other dies in the same pack I created the pull up tab and also the gap in the water melon wonder DSP (designer Series Paper) to easily slide the pull up tab in and out. This is another way to use the new balloon dies and stamps from Stampin' Up! but many more ideas coming soon and video tutorial... As I was chosen as display stamper for the last convention I have over 10 projects to share with you :) so stay tuned and make sure you subscribe to my blog and to my Youtube channel Here! Click on the picture to see Next Project made with Ballon Adventures bundle by Stampin' Up! That's all, I hope you enjoy the project today! Buy supplies to make these projects below... When Available I'll add new products to the list!